So to recap while Magnussen's car is cleared. Massa is out of the session with a water leak, Ricciardo's Red Bull is having an engine change. How bad does the damage look? Will he be back this session? @VS: Hard to tell at the moment. He had slowed down quite a bit before he hit the wall. Massa is having problems this afternoon but Bottas is the first man back out as the session goes green again. @MarcusMak: If they banned every team that crashed or stopped during a practice session there would be no more teams left. Riccardio is changing engine.. there are limit of 5 engines in a season.. will it count as first change or is it only race engines? @leonardo: It's four this season. "rumors" (don't hate me Nate) said that at McLaren the team involved in the development of MP4-30 was also busy with their street P1 model and could have a negative effect on their F1 action - does anyone know this for a fact? @silviu_oana79: That seems highly unlikely. @RB: Vettel is two tenths up on Hamilton at the moment. Regarding VDG v/s Sauber - why did both the parties ask for time this morning? Were they planning some out of court settlement? The way the 2 saubers are going around the track seems like something has been achieved!! @VS: It's all very strange, isn't it. I would assume Sauber is confident there will be no ramifications but who knows. Button is out there on track. His data now doubly important with Magnussen putting the other car in the wall. Raikkonen is lighting up the timing screens - he's on the soft tyre so we can expect him to go top. Raikkonen lowers the benchmark to a 1:28.842 on the soft tyre. His team-mate Vettel is also out there on soft tyres. "Front was a little bit better now but not ideal. That was not a very good lap anyway but the right direction," reports Raikkonen. Vettel jumps back above his new team-mate by four tenths. I don;t think Manor will race this weekend. How sad is that. @VS: I think they will. Missing these two sessions was always likely after the team arrived with no testing under its belt. @Nate : Couldn't catch FP1, with what tyres did the Mercs top? @Arvind: Mediums. FP1 is prime tyre only because the teams save their qualifying simulations for FP1. Ai, Raikkonen still having troubles with the front end. When are they going to give the man what he wants. It was a good decision Alonso and his doctors not to participate in Australian GP this weekend. Just imagine if it was Alonso who crashed today instead of Magnussen!! And what if the hit was a bit more harder! @Donovan : the team always tries, Kimi could be a little more flexible though. Quali sims for FP2 and 3 surely @Nate? @DonovanFroon: Yes, FP3 as well. @VS: We'll see. Instead of focusing on the negatives we should be happy the team returned to the grid. @DonovanFroon since they add Vettel, don't expect Ferrari to gave Kimi the car "he" want's. Rosberg has moved to within six tenths of Vettel's benchmark. Worryingly for everyone else he's still on the medium tyre. Perez leaps into sixth on the soft tyre, still 2.5s down on Ferrari. 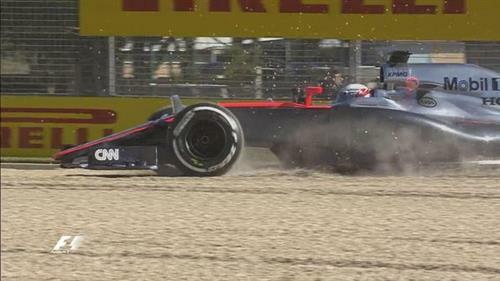 McLaren has advised Button to end his current medium tyre run so the team can put soft tyres on for a qualifying sim.. Honestly, would JEVergne have done better than the Torro Rosso's babies? @Christian Laviolette to have an incredible driver and not use him - does that sound logical? Just give him his front end. He was the last one to win a title for them, deserves some respect. The track is till rubbering in. Mercs on average seem to have a 07-0.8 seconds in the bag? Anyone have seen any modifications on cars since the winter tests ? @ChristianLaviolette: There's nothing major on any of the front runners. Merc certainly doesn't have anything huge from what I've seen.